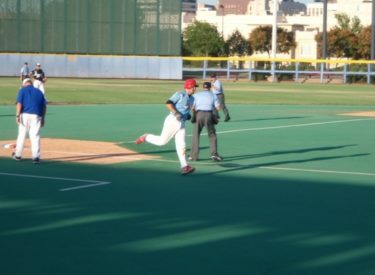 Blake Bergeron and Richard Bohlken were a hit shy of the cycle in Liberal’s 10-2 run rule win over the Denver Cougars Thursday night in the semifinals of the NBC World Series. The Bee Jays have NBC titles in 1968, 1979, 1985, and 2000 with seven runner up finishes. Liberal plays the winner of the Santa Barbara-Seattle game Friday at 7 p.m on Talkradio 1270 and kscbnews.net. Paul Gonzalez improved to 7-0 pitching all seven innings with seven strikeouts and one walk for his third win of the NBC. Richard Bohlken was 3-4 with his fourth homer and a double while Blake Bergeron was 3-4 with a homer and a triple. Bergeron has a team leading 11 home runs this summer and three in the NBC World Series. Liberal scored two in the first when Edwin Arroyo scored on a wild pitch and Bohlken singled home Bergeron. Denver’s Logan Moore homered in the third to make it 2-1. Bergeron tripled in the third and Vaskas chased him home with a ground out to make it 3-2. Gonzalez pitched out of a jam in the fourth when the Cougars (38-18) loaded the bases with no outs but only scored one after a rare 3-6-1 double play from Bergeron to Tomlinson to Gonzalez. Bohlken blasted a towering homer to left to lead off the fourth to make it 4-2. Bergeron’s bomb in the fourth cleared the picnic area in left center to make it 5-2. Sam Konnoff drove home a run with a single in the inning before David Masters singled home two with a drive which one hopped the center field wall. Arroyo drove home a run on a ground out and Liberal had a six run fifth which was their biggest inning of the tournament. Liberal is 37-14.